The rising sun bruises the night sky, its wound the many colors, red and orange and indigo. The stale colors of night upturn their faces to the sky and bloom, becoming the jeweled colors of the tents that scatter the Yitoki camp. Yiska can hear the sounds of his waking village, the fussing of the camels and goats that vie against one another for prime position at the troughs as they wait to be fed, chickens scratching among their feet in the sand for grain. Life is stirred back into the fires, ash floating like snow, the dying coals coaxed into tongues of fire that lick against brush and wood. He knows that Sinjun waits for his return within the tent of his father, Moraji. No doubt his mother Tahki has kept Sinjun busy while Yiska was away visiting the grizzled shaman. His fellow tribesman and women who have stirred in the early light greet the shaman apprentice with cheerful words. He has brought Sinjun a present, some sweet smelling herbs and flowers picked from the canyon, home of his shaman teacher, where water hides allowing for their growth, a rarity this far out on the sands. He hopes they will please her. An expectant smile plays on his face as he approaches the tent. Yiska would hear her before he saw her, which wasn't unusual at all. Sinjun's voice was pitched carefully so she wouldn't disturb the people around them but his mother enjoyed the music while they worked. Sinjun almost always sang while she worked, it came almost as naturally as breathing to her. Sinjun was peeling roots and laying them out for Tahki to slice. She was none the worse for wear for the kidnapping that had happened to her several months ago. They hadn't been intending to harm her, they'd been trying to 'save' her from the savages, but it had still shaken her badly, particularly since they had attacked Yiska when he came after her. Neither of them were seriously hurt, but she was still suffering from some anxiety because of it. She was very happy that Yiska was coming back today. He was in no more danger than anywhere else in the desert with his mentor, of course, but she still felt better when she could see him. Perhaps coincidentally, or maybe not, she'd always been able to pick up on Yiska's moods and presence, she was singing "Wind by the Fireside", one of his favorites, as he approached. Yiska smiled to himself, his ears twitching pleasantly at the soft sound of Sinjun's voice. He unconsciously changed his steps to attune to the song. He positively beamed when he found Sinjun working beside his mother, who looked up and greeted him. "Hello mother, Sinjun." He squatted beside Sinjun and offered her the small bundle of herbs and flowers. "It's good to be home." "Yiska!" Sinjun's face lit up when she saw him and she bounded to her feet. Her eyes widened with delight at the herbs and flowers. She held them close with one hand and hugged him with her free arm. "Thank you!" He chuckled good naturedly as he hugged her back. "You are most welcome." 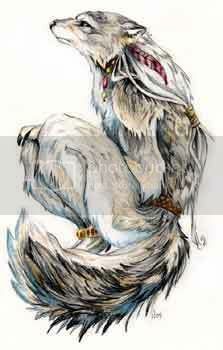 Tahki looked up and smiled softly, knowingly. While it was odd that a Yitoki find such close companionship with someone not from their own kind, this was a special case. Sinjun and Yiska shared an inseperable bond, she was trustworthy and had a good heart. She was not like those other humans, those like Sinjun's own captors. Those that had tried to kill her son. "I hope you are hungry, Yiska." Tahki started to slice the roots and add them to the pot. "The both of us have prepared a feast in no time. Sinjun is such a blessing to have in the home. She has talked of nothing else but your return and I am afraid we got a little carried away." She chuckled. Sinjun blushed a bit as she carefully set the herbs and flowers in a bowl with a bit of water to keep them fresh. The scent of them filled the tent, making her smile. The attack on Yiska had provoked her into violence herself, which was something that very rarely happened. Indeed, she had almost killed the knight that had shot at Yiska, and ironically it had been Yiska himself that stopped her from doing it. Yiska grinned at the rosy glow on Sinjun's cheeks. "It smells good. Is father coming?" He glanced to Tahki as she prepared plates for the many kinds of dishes that she and Sinjun had created. She smiled at Sinjun as she came to help. "Yes, your father is with the council. They have been meeting more frequently now." But of course she wouldn't know why, it was the way of the tribe that what is said among warriors stays among them, and a wife or daughter must never ask. "They must be nearly finished, it is almost mid day." That was a rule that Sinjun had had a hard time adjusting to, but she was learning. She'd found it easier to just stay quiet altogether since piping up with questions would annoy the more traditional and older among the tribe. One of the few things that could be said almost positively about the Anmare bloodline was it was highly matriarchal. Most of the warriors she'd known before meeting Yiska had been women, like her Aunt Sapphira, who was the priestess of a goddess of war. Seeing so many male warriors had almost been as much of a shock to her as describing some of her relatives had been to some of the tribe. That is where Yiska had changed in reference to the patriarchal system. He had grown up in a patriarchal society, where the decisions of men is law and women were subservient, though respected in their own right. But Sinjun had changed all of that. Yiska thought her as his equal in every way. His eyes had been opened, but many others had not. Yiska noticed that Sinjun was quiet when they ventured out among the tribe, her eyes downcast demurely. He wondered if she was happy here. He was roused out of thought when Moraji ducked into the tent. He had a soberness about him that was disquieting. Sinjun genuinely was happy there. She loved him and she loved his family and the friends that she had made amongst the villagers. Often if he glanced at her in the village she would lift those downcast eyes, and give him a mischievous grin since they both knew she was only playing at it to keep the peace. She glanced up and smiled at Moraji in greeting, though it faded a bit when she saw how serious he was, cocking her head in concern. Moraji warmed up as he met the faces of those he loved most. Moraji was fond of Sinjun as well and she brought him joy because of her love for his son. He thought of her as a daughter, and even more, respected her thoughts. He ran a hand over his brow, as if to erase the worry from it. Moraji started up cheerfully as he glanced at the low table in the middle of the tent. "What a wonderful feast you two have prepared! I just wish I had two stomachs, I want to try everything. Starting with that one." Yiska grinned, laughing lightly. He took his place at the table, watching his father's enthusiasm. His father was trying to not let them worry. He was trying to put everyone in a good mood. Whatever he had been talking about with the elders must be ill news. Sinjun picked up on it too, but put it aside for now. Whatever it was, there was no use in letting it spoil Yiska's homecoming, Moraji would get around to it in his own time. That calm, steady thoughtfulness was a trait he'd passed onto Yiska and one she admired in them both. As promised, Moraji sampled every single dish that the girls had set down before him, making contented noises as he ate. Yiska shot Sinjun a grin. He too was pleased with the food, Sinjun had picked up the Yitoki way of cooking quickly. But was he surprised? "How is the shaman, Yiska? Is he well?" His mother inquired. Yiska raised his head. "His teeth are bad, I don't think he eats well." He shook his head a little. "He looks thinner. I will have to lead him here to sample your cooking, mother. He can only eat soft things now." Tahki looked disturbed by this. "Yes, that is not good..."
"He gives me lessons with such passion," Yiska went on. "You wouldn't suspect that his body is getting weak. But I know better. He is getting old and he teaches me with even more fervor when we meet. I fear my stay next time may be longer, because a part of me knows that he is running out of time." Sinjun reached over and squeezed his hand gently. She knew how much the shaman meant to Yiska, he'd taught him for a long time. Yiska squeezed her hand back and smiled gently. "What makes me worried is that he won't be able to pass everything I need to know to me before his spirit returns to the spirit world."